I recently had the opportunity to catch up with Tim Gloege regarding his important new book, Guaranteed Pure: The Moody Bible Institute, Business, and the Making of Modern Evangelicalism (UNC Press), which led us into some larger questions having to do with the histories of evangelicalism, fundamentalism, and capitalism in the United States. The book is available now and qualifies as a must read. HC: For those who haven't read the book yet, can you offer a sneak preview of some of the ways in which you argue the Moody Bible Institute and Business contributed to the Making of Modern Evangelicalism? TG: Yes, absolutely, and thanks for this opportunity to talk about the book, Heath. 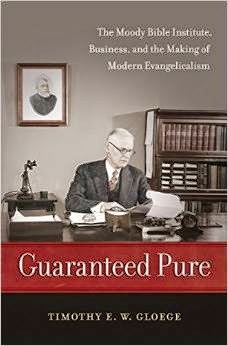 Guaranteed Pure tells the story of a group of businessmen, ministers, and evangelists that developed a particular strain of evangelicalism—what I call “corporate evangelicalism”—during the Gilded Age and Progressive Era. The center of gravity of this network was the Moody Bible Institute (MBI), founded in Chicago in 1889 by the salesman-turned-revivalist Dwight L. Moody. The story begins in the 1870s when Moody stood at the center of a dynamic, if unstable, network of self-described “Christian workers” committed to evangelizing the urban “masses.” It traces the failure of that project and MBI’s transition, after Moody’s death, to a new focus on influencing middle-class Protestantism. Under a new regime, headed by the promotional genius and president of Quaker Oats, Henry Crowell, they battled liberal theology and modified its evangelical message to insure it was safe and attractive to the “respectable” middle classes. 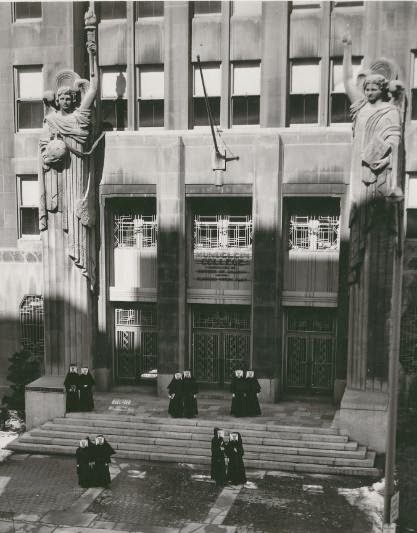 During the 1910s and early 1920s, MBI became a virtual headquarters for an emerging fundamentalist movement. But perhaps more important were the bedrock assumptions that underlay both these economic identities and their religious analogs. It was a vision of the world in which society consisted primarily of individuals constructing identities by making rational choices. Thus, it was not coincidental that modern conservative evangelicalism developed contemporaneously with modern consumer capitalism; they share a similar ideological foundation (one, interestingly, that is often at odds with the findings of modern post-Darwinian science). The second key contribution of MBI and business was the creation of what can only be described as an evangelical brand, which serves as the centerpiece of a conservative evangelical identity today. I find it interesting that despite years of concentrated study, no one has been able to formulate a substantive doctrinal definition of evangelicalism. Even Mark Noll, the leading historian of evangelicalism, has argued that it does not exist in any real sense. I think that understanding evangelicalism as a brand helps to explain this failure. Conservative evangelicals claim to represent “old time religion” a “conservative Protestantism” that embodies an interdenominational “orthodoxy.” But try to delineate that orthodoxy with any specificity and it falls apart. Quite simply there is no stable set of doctrines uniting everyone claiming the evangelical label, any more than there is a stable definition for the Pepsi generation. The technique of using branding as a stand-in for traditional creeds and coherent theological traditions began with The Fundamentals: the twelve volume manifesto against modernism that was distributed like a massive promotional campaign to every minister, missionary and religious worker in the United States. Funded by Los Angeles oilman Lyman Stewart, the project, under Crowell and other MBI leadership influence, was envisioned as a statement of an interdenominational orthodoxy that would rally and unite conservatives from across denominations. But it quickly became clear that, apart from a shared distrust of modernist theology and higher criticism, there was very little common ground in the coalition. The project organizers took pains to garner a broad denominational representation among the authors, but as an actual creed or substantial theological statement, it fell far short. In the end it was the physical publication itself—printed on good paper and presented in book form—that served as the representation of an orthodoxy they could not formulate. It was this that ultimately became the namesake of the fundamentalist movement. When the “fundamentalist” brand became tarnished in the 1920s, corporate evangelicals at MBI and elsewhere shifted to using the older label “evangelical,” which has been the preferred name ever since. Related to this evangelical brand was a final contribution that MBI and modern business made to modern evangelicalism: a means of generating trust for persons and institutions without denominational affiliation. One of the major hurdles that modern corporations faced early on, especially those selling processed foods, was to generate trust among a population used to buying products from people they knew personally. Companies overcame this challenge with “old fashioned” trademarks, like Crowell’s iconic smiling Quaker on each sealed box, while simultaneously raising suspicions of the traditional sources of product, the open oat barrel. MBI under Crowell’s direction was among the first religious institutions to use these same methods. Raising doubts about the theological reliability of traditional mainline denominations, they positioned MBI as a provider of “old time religion.” Dwight L. Moody’s longstanding distaste for theology and creeds over a practical and personal faith made him the perfect religious trademark. It did not matter that the specifics of this “orthodoxy” were never stable, any more than that the recipe for a breakfast cereal or pancake mix was never set in stone. What mattered was that the consumer experience remained the same. So long as it did, religious “customers” could trust the purveyor of this nondenominational product, guaranteed pure. Our religious landscape today is dominated by non-denominational churches and para-church organizations that rely on these same methods to create their reputations and constantly recreate the “old-time religion” they peddle. Figureheads with impeccable moral credentials and loads of charisma serve as replacements for denominational affiliation or established theological traditions. HC: Can you highlight some points of continuity and discontinuity between your interpretation and two other important books on the subject: George Marsden's Fundamentalism and American Culture on the one hand and Matt Sutton's American Apocalypse on the other? TG: Marsden of course has been the gold standard in describing the various religious sources of the fundamentalist movement—that is to say, tracing the theological genealogy of the key ideas that many conservative evangelicals hold. It is a story of continuity and how evangelicals held to older beliefs and methods while the world around it became “modern.” My book is much less focused on theology than Marsden. But inasmuch as I addressed these issues, I asked the opposite question: notwithstanding the claims to represent “old time religion” and real points of continuity to antebellum Protestantism, what were its novelties, and how do we account for them? I found it striking how fundamentalists thoroughly decontextualized the beliefs they borrowed or inherited. Yes, most of the theological raw materials fundamentalists used (though certainly not all) had been around for some time, but they were used like pieces of glass in a mosaic or words cut out of a magazine for a ransom note. They ways they used those “traditional” bits were far different from the ways they functioned in their original context. But the major difference in my book is that the theological story is secondary to the cultural story. A central theme is that everyone’s religion—even those claiming to be proponents of “old time religion”—is a product of their cultural milieu. In fact I think those who are least willing to acknowledge the influence of their cultural surroundings are those most affected by it. The implication of this is that I see fundamentalism to be more of a product of modernity than a reaction to it. Given the different starting places of Matt Sutton’s and my book, I think they are surprisingly compatible. (Full disclosure: my final revisions to my manuscript were made in light of having read and wrestled with a draft of his landmark work.) It’s true that for my story, premillennialism and the accompanying apocalypticism often serves as the tail more than the dog. In some cases, especially before the 1910s, I see premillennialism as a belief that some of my key figures had been forced to accept because they wanted to read the Bible “plainly”—like a businessman would read a daily newspaper. Ultimately, it became indispensable to conservative evangelicalism, but for many it was less from an interest in the end-times per se, than for what it allowed them to do in other arenas. Regardless, once premillennialism and the apocalyptic state of mind that accompanied it became attached to corporate evangelicalism, it most certainly exerted the enormous influences on evangelical cultural engagement that Sutton describes—both a motivation to “occupy” and the source of their deep suspicion of government. My story, then, is the other side of the coin: explaining why evangelicals’ suspicion of government intervention is paired with an irrepressible faith in business and markets to solve social problems. HC: Your book crosses over into any number of different fields. What do you see as its main contributions to the "new" history of capitalism? TG: In some ways I feel like more of a debtor to histories of capitalism, since much of my work lies in mapping well-known economic developments to religion. But my work might have two broader points of interest to historians of capitalism. First, I wanted to challenge the surprisingly-resilient assumption that modern consumer capitalism is antithetical to religious adherence. Whether evangelicalism is better or worse for its dependence upon capitalism, I leave to the theologians to debate. The important point to my mind it that there is a striking compatibility between the two; evangelicals did not accommodate capitalism, they used it as a tool for survival in the modern world. Second, I wanted to note some significant ideological tensions that I saw between modern business ideology (including some allied professions like engineering and law) and modern science. The longstanding assumption (at least in the caricatured form it takes in public discourse) has been that “modernity” stands as a unified thing over and against things “traditional” or “anti-modern” like religion. But the unity of conservative evangelicalism and modern consumer capitalism offers an alternate explanation. Perhaps modernity is bifurcated and the grand battle between religion and science is in fact a battle between an individualistic, choice-oriented, and certitude-seeking business ideology and a more corporately and scientific understanding of the world oriented to statistical populations, development by means of nature or nurture, and probabilistic knowledge. HC: In the last decade a number of younger scholars have investigated the relationship of religion and class in the Gilded Age and Progressive Era. Do you see a coherent picture of this relationship emerging or are there unresolved tensions in this growing literature? TG: I think the mere fact that class and religion are being investigated in this way is itself representative of a coherent picture—and an exciting one at that. For far too long a fear of “reductionism” led many historians of religion to ignore class altogether. We now have important theoretical groundwork laid by Sean McCloud, and work on elites, middle classes, and working classes (which I won’t try to enumerate for fear of leaving something out—especially since I have some catching up to do in the field). The consensus, as I see it, is a growing sense that class must be taken seriously and on its own terms—that is, using models and theories developed by those fields devoted to labor, class, and capitalism. Thus, religion has become part of the story of class in two ways. On the one hand, religion plays an important role in what have often been seen as “secular” class developments. For example, we know it was being used both by business elites and many of their middle-class allies (including both conservative and liberal ministers) to justify some pretty terrible treatment of working class folks. But it was also used by working class Christians and their allies to resist and challenge that aggression. Religion also played a continuing role in internal class formation during the Gilded Age and Progressive Era—this especially among elites and the “respectable” middle classes. Second, our understanding of religion is being shaped by a sensitive reading of class dynamics in religious contexts. This means that some battles that used to be seen as purely theological disagreements might also have important class dimensions. This again speaks to the embeddedness of religion in culture. If there are unresolved tensions in this literature, it may lie in the lingering temptation to equate the entirety of a particular religious identity or theological orientation to a particular class position. I think the reality is a little more complicated than that. There is no doubt that class shapes religion, as I state above, but it is not a one-to-one or absolute correlation. Not everyone that went to a church from a “mainline” denomination was upper-middle class, for example; and although Pentecostalism began as a working class religion, it was also adopted by upwardly mobile middle-class people who put their own stamp on it. Given the Populist movement of this same time, Bryan's "Cross of Gold" speech, etc., why were evangelicals so willing to embrace the business world even while rejecting big (for that time) government? Does Gloege's book cover that at all? I mean, theoretically, evangelicals could have come up with their own version of the Social Gospel or something. That's a good question Gadfly. Although my focus was on corporate evangelicals, Populist-oriented evangelicals do play an important role in my story: both the "plainfolk" and pentecostal varieties. And, yes, some in these groups did create their own social gospel variants (focused perhaps less on industrial relations and more on resisting a rising professionalization). These efforts and movements were consistently opposed by corporate evangelicals. It was, I argue, the dominance of populist-types in the fundamentalist movement of the 1920s that led MBI to disavow the label and back away from their formal involvement (in the WCFA for example). I do not directly address why this populist/plainfolk evangelicalism falls into decline. But fortunately we have great work from Bethany Moreton and Darren Dochuk that do (and, of course, Susan Curtis' does similarly for the Social Gospel). As to why evangelicals rejected "big government," I think Sutton's work, referenced above, addresses that. Business became so important to evangelicals because it provided them with a means to be modern while maintaining the core individualistic orientation of their faith (i.e. their understanding of having a "personal relationship with God"). Sorry, that anonymous comment is me (Tim Gloege) above. Tim, thanks kindly for the reply. It looks like your book and Kruse's dovetail fairly well, with him taking off from where you start, a generation or two later.